Pond Biologics® Cold Weather Beneficial Bacteria contains a highly concentrated blend of psychrophilic (cold loving) microorganisms that are capable of reproduction and function in cold temperatures, essential vitamins, and catalyzing enzymes. They infuse bacterial cells with the vitamins, minerals, and amino acids essential to healthy and robust cell development. This microbial blend is formulated for water temperatures under 50°F. The accumulation of fish waste build-up can overwhelm the naturally occurring microbes in a water ecosystem creating undesirable and unhealthy water conditions. Pond Biologics® Cold Water Bacteria Blend effectively controls organic waste and lowers nitrogen and ammonia in ponds and lakes. Breaks down fish waste, uneaten fish food and other organic debris under cold weather conditions. Maintains a cleaner and healthier ecosystem. Reduces nutrient overload that can create algae blooms during the warmer months. Improves water clarity all year long. Environmentally Friendly and safe for all animals, fish, plants and humans. Includes a measuring scoop for easy application. 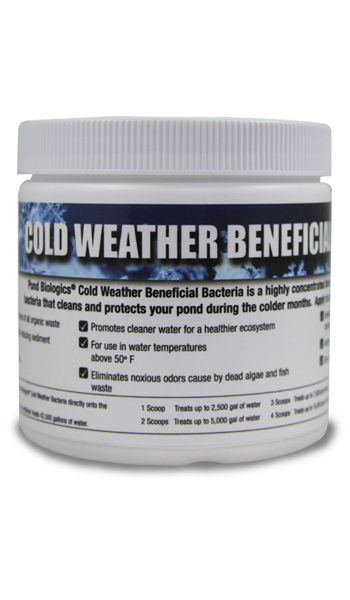 Sprinkle Pond Biologics® Cold Weather Beneficial Bacteria treatment directly onto the surface of the water. Repeat treatment every two weeks.